A salt pool is one of the most desirable things for a homeowner. And in some cases can drive up the price of a house a few thousand dollars. But what makes them so desirable? Is it the fact that the salt makes you feel like you’re on a tropical island, maybe that you can open your eyes under water without the chlorine burning a hole through your face, or maybe it’s just desirable to you because you were told it’s desirable. Either way, yes, a salt pool is a wonderful thing. They are becoming more and more affordable as the market for a salt cell generator becomes more and more affordable. They are wonderful, and often a doctor recommends a salt pool over a chlorine pool for your precious, delicate skin. 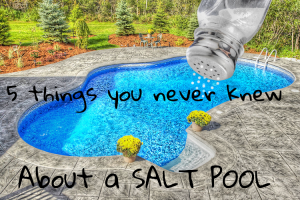 But here are five things you never knew about a salt pool. Is it Really a Salt Pool? – A salt pool does not use just the salt to clean the pool and properly sanitize it. 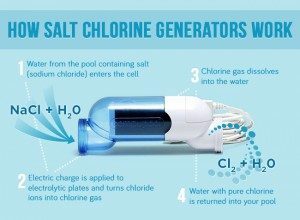 In fact, it is a salt generator that generates chlorine. A salt system uses the sodium that has been added to the pool, as it runs through the piping the “salt cell” has metal plates that use electric currents to charge the salt ions into chlorine gas. The chloride property is then dissolved, and pure chlorine water returns to the pool. However, the levels of chlorine that are in a salt pool versus a chlorine pool are night and day. A salt pool maintains a steady low level of chlorine between 1-3 PPM which is why it is enough to keep the algae out and low enough that you can open your eyes underwater and enjoy a pleasant swim. Whereas a chlorine pool is a constant up and down with chlorine between 0 PPM and cloth bleaching levels. 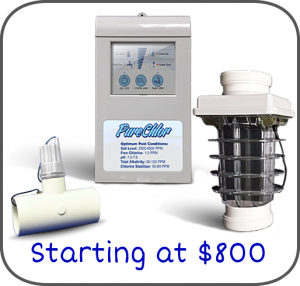 Spending a $100 could save you $1000- When it comes to picking the right cell, it can be crucial to pick a salt cell generator that is rated for almost double the gallons of your pool. Most salt cells come rated for different size pools. 10k, 25k, and 40k. When you are looking to get the right cell, go with one that is rated for more gallons, and it will increase the life of the cell up to two years. Example: if you have an average size 10k-12.5k gallon pool, go with a 25k cell or even a 40k cell, because a 10K pool using a 10k system will require the salt cell system to always be on its toes producing chlorine constantly, and always running to try to keep up with the production You will most likely have it constantly at a 100% production rate, especially during the summer. But if you buy a 25k cell for a 10k pool then the cell production rate can be set to 50% and prolong the life of the salt cell for up to a couple years. So spend the extra $100 on the initial cell to save $1000 in the long run. Converting to a Salt Pool- Any pool can easily become a salt pool. The term conversion is often used in reference when you are switching a pool over from chlorine to salt. This makes it sound like a very elaborate renovation and, maybe some heavy machinery needs to be brought in and the pool might need to be ripped out by the hulk to make it easier. NOT AT ALL , A salt generation system can be easily installed by a pool professional with in a matter of just a couple hours. It is made up of two main components, the computer ( wall unit) and the cell ( in line pipe fitting) . So don’t let the term conversion scare you or your wallet. Its more of an addition to the equipment then a renovation. Salt cells are great but they aren’t quite the end all utopia some salesman will make them out to be. 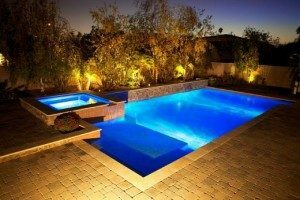 Yes, they are very luxurious, yes they can save you money in the long run, and yes they help out by automatically adding chlorine to the chemistry of your pool. However you can install a salt system and wipe your hands clean of any pool maintenance. A salt cell also generates a higher positive pH constantly raising the pH in your pool. So a pH down (Muriatic acid ) often has to be added. Also, the cell needs to be inspected, cleaned, and reset once every 3 months. The pool will also still need the normal amounts of skimming, brushing, and vacuuming. And, obviously, salt will need to be added when the PPM drops below the required amount.YOu still need to clean your pool but the chemical balancing is much easier. They may be more affordable than you think – When salt cells first came out like, all innovative technology, they were very expensive. However, also like a plasma tv, competition arises and prices fall. There are some great salt cell systems out there that can be installed for less than $800 . A great Salt Pool is now more affordable than ever.